Skunks are members of the weasel family (Mustelidae) and thus have musk scent glands. The skunk can spray the viscous liquid from these glands, which serves as its primary mode of self-defense. The most common problems that skunks see to cause for homeowners involve their smell and their digging. Skunks will oftentimes choose to live under a person's porch, and cause an odor. Even worse they sometimes die under such porches or under homes, which can create a horrible smell. Skunks also have a nasty habit of digging holes in lawns to find food, such as grubs, in the soil. If you want to control skunks, they should be captured and removed from the property. BAIT - and some bait, like cat food or marshmallows. SOLID WALL BOX TRAP - You can also use a solid-walled box trap, so that the skunk can't spray. BLANKET - After you trap the skunk, approach it while holding a blanket in front of you, and drape it over the trap to prevent spraying. LETHAL INJECTION - If you need to euthanize the skunk. BODY GRIP TRAP - If you plan to kill the skunk with a lethal trap. MOTH BALLS - These will not affect skunk behavior in the slightest. Plus they poison the environment. Here we see a skunk caught in a trap. Skunks can be trapped and removed, and this is the best method of skunk control. Sometimes, it's possible to set one-way exclusion doors over the holes that skunks are using to enter/exit a space under a porch, and this can block the skunks out. 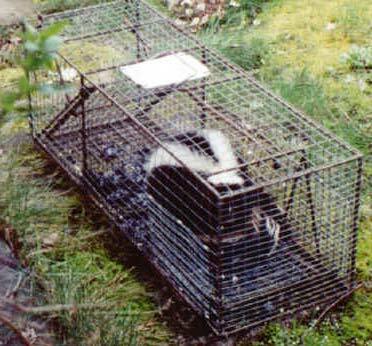 However, the most foolproof way to take care of a skunk issue is to physically trap them in a cage and remove them. How to Get Rid of Skunks in Your Yard - A skunk in the yard isn?t as destructive as some of the other nuisance animals of similar size, but a skunk poses one special kind of threat that other animals do not: lingering, potent odor. A skunk that decides to live in your yard will not spray until it feels threatened, and this usually occurs when dogs or other pets encounter a skunk living somewhere around the home. To get rid of a skunk in your yard, you can try commercial deterrents and home remedies, but these methods are unreliable and have no proven effects on nuisance animals. The best way to get rid of a skunk is to trap and remove the animal. Lethal traps are not necessary. Live traps are very effective and can be baited with almost anything though skunks enjoy tuna fish and other smelly meats. When waiting to release the captured skunk, allow the animal some time to calm down. This will help lower your chances of being spray during release.